Want a gentle, back-friendly, total-body workout that doesn’t feature pounding, twisting, or dependence on just one major muscle group to elevate cardiovascular effort? There may be a rowing machine in your future. The good news is that it’s a fairly easy decision to make. Dig into the world of rowing machine reviews in search of the best rowing machine, and you’ll quickly learn one thing: you’ll basically be deciding between the Concept2 Model D and something else. Even the Concept2 page on Amazon knocks all the others out of the park, with a series of super-thorough but short videos broken down into manageable bites of rowing machine advice on everything from how to use a rowing machine, proper technique, intensity and pause workouts, and more. As my dad would say, these Concept2 people know their onions. However, as is often the case at Chez Rick and Kathy, the Consumer Reports highest-rated gizmo isn’t the one we ended up buying. We landed on the Xebex Air Rower instead. That’s what Winston wants to know. In addition to the four variables Consumer Reports tested, the pertinent factors for us also involved cost, storage options, seat height, a touch of arthritis (or whatever the hell it is that’s making my left index knuckle huge), and my delicate tail bone/backside. We’re definitely a “zero pain but ALL the gain” kinda couple. So, why did we go with the Xebex? The Concept2 Model D and the Xebex are (as of this writing) priced almost exactly the same: both come in at $945 on Amazon.com, with the Xebex currently shipping an additional free “conditioning pack” composed of “Back Saver Pad, EZ Speed Rope, 20-pound Premium Wall Ball, and 15 pound Slam Ball.” Beyond the extra goodies, however, the two machines are not equally matched, feature for feature, and this is where our path diverged from Consumer Reports. Where to operate and store a rowing machine was a huge care-about for us in our not huge home. All rowing machines need roughly 9 x 4 feet when in use, which actually isn’t that much to ask in an average room. It’s sort of the conversation space between facing furniture. 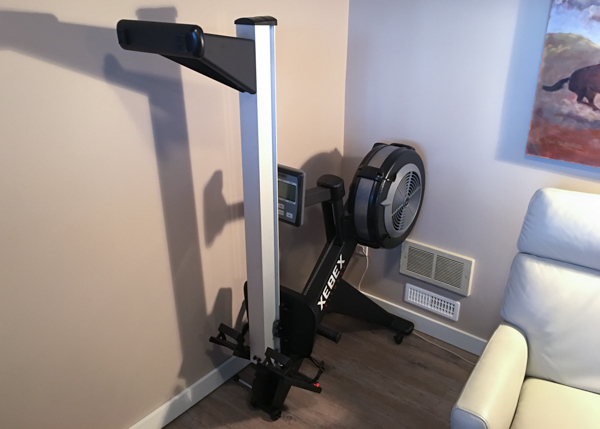 We simply don’t have ~40 feet of unused space in our house, however, to dedicate permanently to a piece of exercise equipment. We needed something that stored upright and was easy to move into place. The Xebex has an easy-to-use hinge system. You just pull out the pop-pin, fold the unit neatly in two on to its four sturdy wheels, and whistle it into a corner and out of the way. If you can lift a 12-bottle pack of Perrier into a grocery cart and wheel it to the checkout, you can handle this. It’s also a much sturdier unit than the Concept2, which means that even at maximum intensity by a big guy it feels solid and locked in place. It also means it’s a much heavier unit than the Concept2. However, with the fold-up design, handle, and four wheels, it’s also much easier to move around, and we don’t plan on carrying it up or down stairs any time soon. The Concept2 Model D separates into two parts for storage, so it can also compress into a tidy footprint when not in use. However, we liked that the Xebex stays in one piece and has a solid base of four wheels to lightly skootch around on. It just seems like an easier set-up/tear-down system to us after about a month of use. 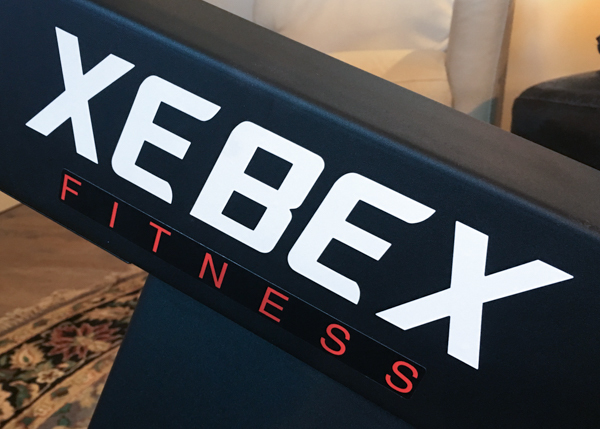 The Concept2 Model D has a standard seat height of 14″ from the ground, where the Xebex has a higher seat of 21″, or roughly the same as that of a normal chair. This makes mounting and dismounting the machine and getting your feet into the adjustable foot pads easier. 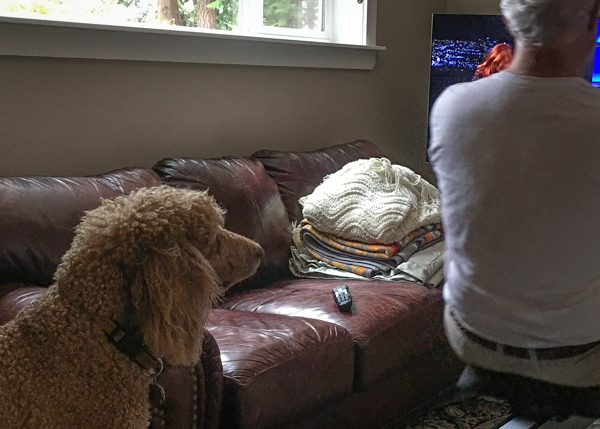 For Rick at 6’1″, this is more important for him than for me at a piddly 5’8″, but still… my theory is that anything that makes exercise easier and more enjoyable is worth consideration. Here’s where the pricing game came back into play. Concept2 also has a newer model, the Model E, that sells from roughly $200 more than the Model D, and one of the big differences is… you guessed it! The seat is positioned 20″ from the ground. Plus, the Xebex comes with a nicely padded seat (as do I, so that works out well). If you’re looking at rowing for 45-60 minutes a day, that extra seat padding can make a huge comfort difference. After all, the lungs can only benefit from what the bum can endure. There’s extra padding on the thick rubber Xebex handles as well, and while there is much less wear-and-tear on your hands than I would have expected (if you’re rowing correctly, which means you’re holding the handle loosely with the ends of your fingers like you’re carrying a suitcase, keeping your wrists flat), the handle on the Xebex is light and comfortable. No issues with that lovely knuckle of mine. The tiltable, battery-operated display on the Xebex doesn’t have the back lighting offered by the Concept2 “Performance Monitor 5” (PM5). This isn’t a huge issue for us as the display is still reasonably visible as you can see below. Although the Xebex display is more limited in terms of fancier tracking of split times, etc., we don’t care. We’re not in this to compete, so the more feature-rich display doodads actually only serve to confuse the user (me). It tracks distance, speed, time, watts, paddle width, calories burned, and with the addition of a compatible heart-rate monitor, heart rate. Just hit “start” and begin to row, and all the metrics start tracking with the first pull. There’s even a programmable interval function, but as I manage this with the order of songs on my rowing playlist (below)… meh. Yup. I blanked all right. Fortunately, as mentioned above, it’s pretty intuitive, and for the non-gym rats/serious outdoor rowers among us, hitting “start” and rowing will get you all the info you need. 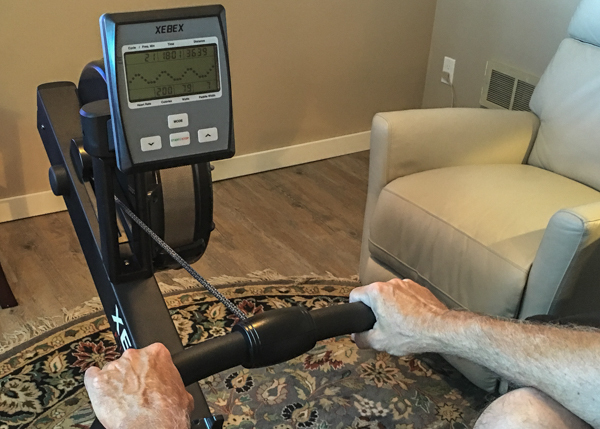 Finally, the webbed straps that keep your feet anchored to the foot rests tend to loosen a little over the course of a rowing session, so occasionally you might have to pause to give them a yank and cinch them up again. However, in conversation with other rowers, I’ve come to the conclusion this isn’t a problem unique to the Xebex as others report the same minor irritation with other models. That said, it is easily fixed: just attach a couple of stick-on velcro pieces to the strap ends. The H2O FitnessSeattle Wooden Rower WRX1000 tied for 2nd place in Consumer Reports with a score of 72. Our local fitness equipment store mentioned that they get feedback that the webbed “chain” doesn’t get as high marks from their customers as does the actual chain style. One reviewer on Amazon commented: “Leaks,” which shouldn’t be a problem as it is currently unavailable. Maybe they’re looking into the leak thing. Also tied for 2nd place is the WaterRower A1, score 72. Others besides Consumer Reports seem to like this model: it scores 4.7 stars across ~170 reviewers at Amazon. 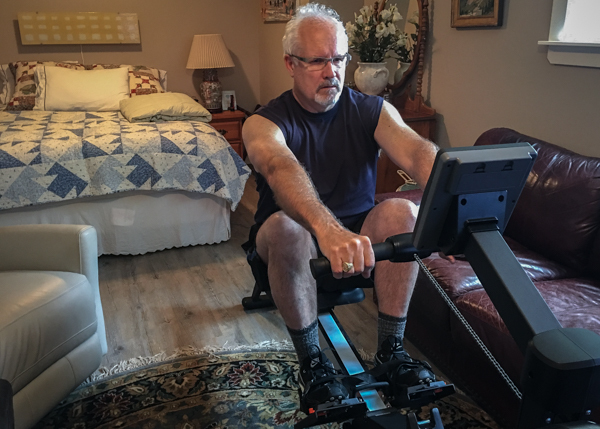 Having lived with the lovely breeze that a wind resistance model supplies–plus the possibility for heading downstairs for a quick row and encountering a soppy mess–makes us unlikely candidates for any water rower, regardless of the ranking on Consumer Reports or Amazon. I find listening to appropriately tempoed music has always heightened my enjoyment of any workout experience. (Masking the sound of my gasping for breath seriously amps my ability to slide into the “fun!” zone.) But believe me, it isn’t easy finding a rowing machine playlist already pulled together for a 50-something rower who wants to keep her heart rate in the 100-130 beats-per-minute zone. For me, this translates to roughly 22-30 strokes per minute, depending on if I’m warming up, zooming along at coasting speed, or indulging in the occasional sprint for some interval work. It is, admittedly, a very eclectic mix, which works nicely for me. Want a more strenuous (or gentle) workout? Futz with the wind resistance damper until you find your sweet spot, then hop on for the ride! And finally, for when you step off the rower and ease into a lovely stretch routine (you do stretch, right? ): “Hello” by Adele, or “At Last,” by Etta James, no SPM for either one. Just three minutes of gentle anti-aging body care that’s as important, if not more so, than your time in the seat. Trust me on the stretching. Sometimes it helps to have a visual reminder of what, at the highest level of abstraction, matters the most about a subject. Flashback: my teen-aged bedroom plastered with David Cassidy, Michael Jackson, Davey Jones, and a brief ill-advised flirtation with Donny Osmond. This poster is actually way more helpful than any of the above ever turned out to be. A great starter book for those stepping up to a rowing machine for the first time, or for the rest of us who just arrogantly hopped on and figured we knew everything there was to know about this mighty machine. It’s a little quirky, but enjoyably so, and full of helpful tips on how to row, the benefits of rowing, how to think about keeping your body fit for the rest of your life, and a bunch of stuff in the middle. According to Amazon reviewers, this is a much more technically sophisticated tome for those interested in improving their on-water technique, achieving their PR (Personal Record for athletically-challenged among us), and so on. I’ll have to take their word for it. I’m still grooving with the “Zen of Rowing” vibe, the “rowing for fitness” mind-set, and the white-haired model reflected in the “Row Daily” book above. Consumer Reports chose not to include the Xebex at all in their most recent testing, so it’s hard to compare apples to apples without putting it through its paces in their lab. However, recent conversations with our local gym buddies and fitness equipment dude in town, along with the price point, higher and more cushy seat, padded handle bars, sturdiness of build, and ease of mobility around our guest/TV room convinced us that this workhorse deserved a chance, and we almost always root for the underdog. Indoor rowing machines were originally called ergomachines (or “ergs,” by the cool kids) as they measure the amount of work performed. Why ellipticals or any other fitness machines that measure calories burned, distance run, etc. 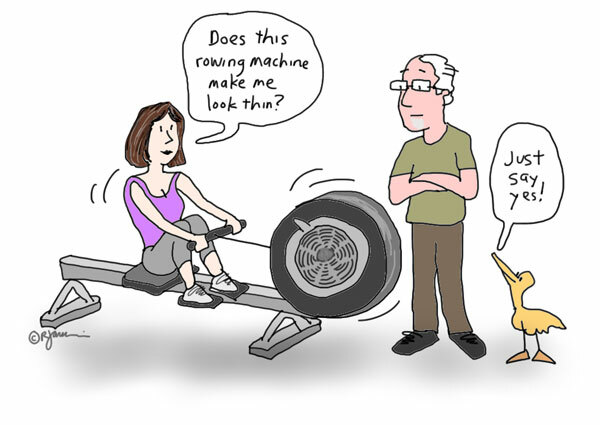 aren’t also called “ergs,” is because the rowing machine got there first. They’ve been around since the 4th century BC as onshore training devices for inexperienced oarsmen, but they weren’t known as ergs until the early 1960’s when they became the first piece of equipment that could precisely measure human power output. Probably my favourite aerobic machine at the gym but I haven’t used it much lately. I’d like to find a better handle for my aging wrists; ideally, I surmise, in an inverted v with the lower ends slightly closer to my body. Our obliging gym owner has been unable to locate such an adaptation for me as yet. I suspect the usual handles come much closer to actual shape of real life oars. I haven’t tried your fav brand as the gym has Concept2. Cushier seating would certainly get my vote though. “My” rowing machine will continue to live at the gym. I’m not willing to give up household real estate while it is still fairly convenient to get to the gym. Hey Kathy! Thanks for the kind words. Take a ride on one in your local gym to see what muscles it wakes up and how you like it… I was surprised! Nothing hurt those first few rounds, but I did lie in bed those nights with a gentle “humming” in muscle fibers that I had forgotten I owned. Loving it! Next post: Merry Christmas 2016!